Becoming a being of frequency, of light, of dimensional fluidity. Seeing above, beyond, behind the holographic walls of the matrix. Deprogramming. Unplugging. Learning to ride waves of higher consciousness, bringing awareness of the non physical world, of other worlds and dimensions. Do we choose the blue pill? Trumpocalypse, war, poverty and predators? Or do we choose the red pill and let the rabbit hole show us the cosmic truth? More and more people are being pushed to the point of choice. Red or blue pill? Believe or give up? Change or accept the status quo. To give up is to check out or surrender to the matrix. To fight is to breathe deep, seek stillness, release karma and connect to those other worlds. Quantum existence is a feeling, a knowing, an expansion of consciousness. It is a state of being. Of fluctuation and slippage, highs and lows. It is being more than a matrix avatar, a yes man, a service to self slave. It is rising above polarity, hate and fear. Speaking frequency as a language. Conscious awareness of energy as a living breathing force, as everything. To tune in we seek stillness. Finding a quiet space for meditation, reflection, energetic expansion. Embracing a new perspective on the world, the universe and everything. We practice mindfulness. We are present. We are grateful. Heart led living is the effect of heart chakra activation. Of being in the love frequency. To reach this vibration fear must be let go, anger and hate released. Stillness acquired. Balance and alignment sought. 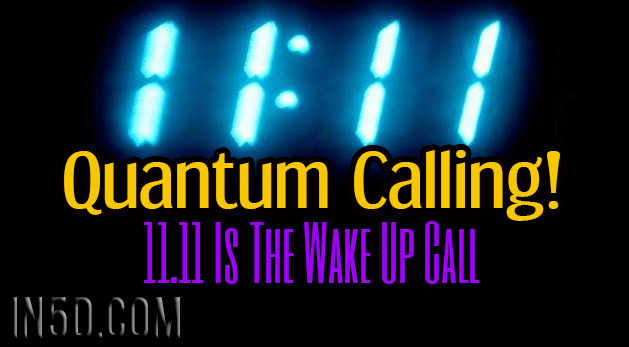 11.11 is the ‘wake up’ activation code. It is also your welcome hug from the fifth dimension. There is reassurance in the code, love and hope in the numbers. There is more to the world than meets the eye, so much more. And this is a wonderful thing, a beautiful thing to be part of. Embrace the wake up call. Surrender to higher vibrations of love. Release fear. Learn to surf waves of quantum evolution. Is it not better to be surfing than drowning? To be riding waves of recalibration, upgrades to a better way of being.